While we’re in the depths of Melbourne’s winter, a lot of girls (mostly from the other hemisphere!) have been asking for tips for summer dress patterns. To get you started, I thought I’d show you a few of my favourites for beach holidays or lazy days by the pool. Who knows? Maybe it’ll help me escape winter for a few minutes as well! I’ll start with the Fabulous Freda. This really is the ultimate sarong! It’s such a simple summer dress pattern to work with. Think of it as a pull on piece, great for those hot days by the pool. The clever addition of a small section of rear elastic makes it so much more comfortable to wear – the front knot doesn’t need to be super tight, just tight enough to let the elastic do its work. I really do love this one, it’s so versatile. Wear it as a skirt or as a dress. Wear it out for cocktails or a to a BBQ. Here’s another thought… You could make one up in light towelling for a luxurious summer bathrobe! Just writing this makes me want to jump on a plane and get out of winter! 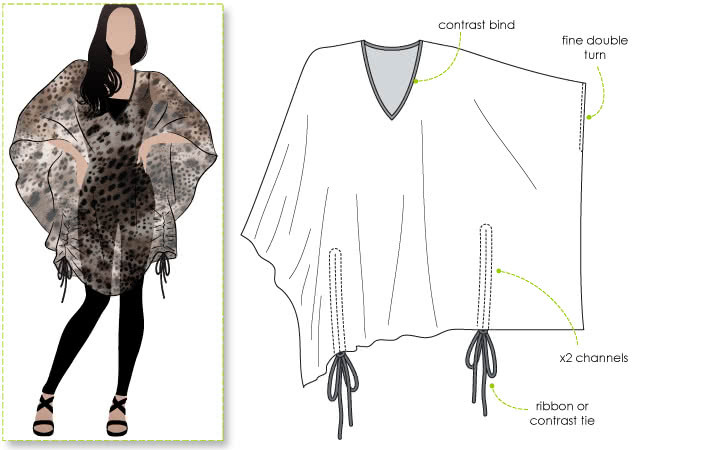 Next up is the Kitty Kaftan. 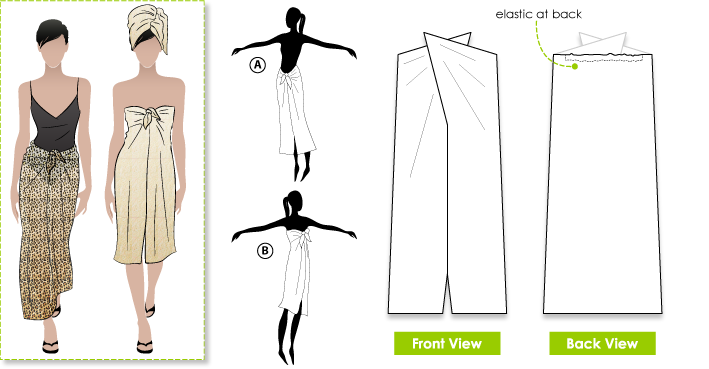 It’s another very simple summer dress pattern to work with. It seems people are still loving kaftan patterns too! The ties on each side set this design apart from a basic kaftan. While I’m still dreaming of designs that you can throw over the bathers on a beach holiday, this one can be dressed up by choosing a fine silk. For a more casual look a rayon fabric or gauzy cotton would be perfect! Last of all, I’ve got to show you the Sandy Top (sand / beach – get it?). This is another fabulous kaftan pattern that’s been very popular lately. 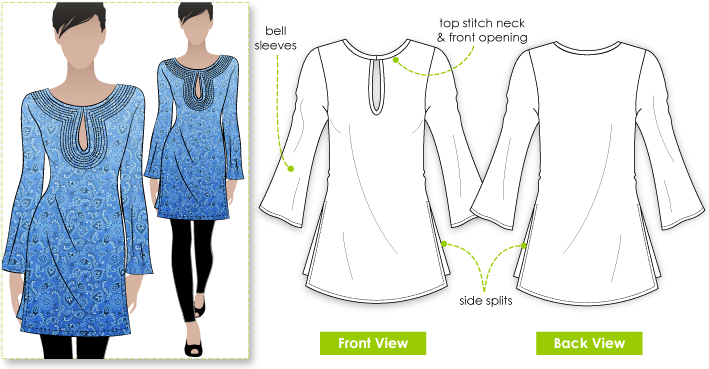 I’ve added some side slits, bell sleeves and a cute front opening to this one. The Sandy Top would be a fabulous “going out” top – even on a beach holiday, you always need at least one! You could take it to the next level by adding some of your own embellishments. Think about some sequins, decorative stones or beads (even bugle beads) around the neckline. Don’t you think a colourful printed silk would be amazing? So there you go – a quick recap of some of my favourite summer dress patterns. I guess it’s time to stop daydreaming and get back to Melbourne’s winter! I’ll be in touch next week with our new patterns for July. There’s a lot of work to do before then! I’ll be in touch next week with our new patterns for July. There’s a lot of work to do before then!